A small ensemble class focused on the elements of playing music as a cohesive group. Drawing from jazz and other improvised music traditions, we will focus on developing musicianship skills like rhythm/groove, improvisation, listening, interacting, expressing, soloing, accompanying, dynamics, theory, and phrasing. Throughout the series, we will workshop several pieces, which students will then perform in a session-end performance at Wave & Circuit. This ensemble is taught by Naomi Siegel. Students must have proficiency on their instrument/voice including being able to keep time, have some knowledge of all 12 major keys, and be willing to improvise and listen. Please email lakebottomsound@gmail.com to make sure you are a good fit for this ensemble. Students must commit to the whole series and come on time. Registration for this ensemble requires payment in full by the first meeting of the session (unless special arrangements have been made). Payments can be made by cash, VenMo (@NaomiMoon) or check (made out to Naomi Siegel). Tuition not received in full by the first meeting of a session will incur additional $10 charges per week. Refunds cannot be given once classes/ensembles have begun. Join Naomi Siegel for jazz theory and improvisation workshops. We will focus on subjects like scale degrees, pentatonic scales, spelling chords, major modes, rhythm/feel and diatonic harmony. Students must have basic proficiency on their instrument/voice including being able to keep time, have some knowledge of all 12 major keys, and be willing to improvise and listen. The pre-registration rate for these classes requires payment in full by the first meeting of the session (unless special arrangements have been made). Payments can be made by cash, VenMo (@NaomiMoon) or check (made out to Naomi Siegel). The drop-in rate must be paid at each class attend. Refunds cannot be given once classes have begun. Building off the positive energy from last year's Improvisation classes, Lakebottom Sound is excited to offer a new round of Improvisation classes. In this 4 week session, we will continue exploring tools for listening, expressing and improvising. We will also be including a class on the use of electronics! Please join us and spread the word. An opportunity to explore Pauline Oliveros' Sonic Meditations with Jessica Catron and Naomi Siegel. Sonic Meditations is a collection of text pieces that bring in our entire sonic environment as part of the artistic experience. These meditations were created as "an attempt to return the control of sound to the individual alone, or within groups, especially for humanitarian purposes; specifically healing. "Sonic Meditations are intended for work over a period of time with regular meetings. No special skills or musical experience are necessary. " Explore musical improvisation with Naomi Siegel, acclaimed musician, composer, and educator. Develop improvisation skills for any musical context in a nurturing environment. 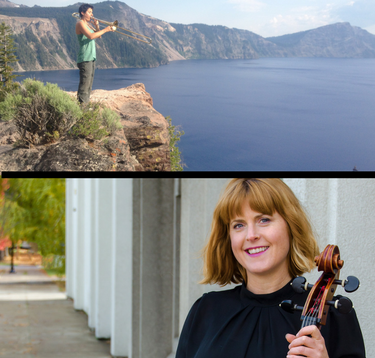 Using creative limitations and techniques to build listening awareness, participants will walk away from this workshop with an increased connection to making music and new ways to practice individually and in ensembles. No prior improvisation experience necessary. Naomi has a way of harnessing creativity to aid self-expression while spreading healing and equality through music. A leader by example, she skillfully does this in her own art, and inspires students how to as well. Naomi is calm, focused, brilliant and *cool*. She puts the most nervous students at ease, adapts her content and presentation to meet every player’s needs, and casts a spell over the whole group. In her improvisation workshop, she engaged students in guided activities that gave them a great sense of confidence and ease at expressing themselves through music. Naomi provided powerful techniques and clear directions on using them to make great progress toward personal evolution, And while she demanded a lot from the students, she also created a calm atmosphere in which to work and explore, which made the benefits even more effective. Naomi has developed very approachable techniques for getting non-jazz students involved in basic improvising and really opening the students’ eyes & ears to various possibilities of expression. She has thought through a lot of musical issues (developing your own voice) and life issues (where you fit in the world and how you want to be perceived and accepted by others regardless of your gender). I applaud her for all of this! Naomi Siegel conducted an exceptional workshop for the jazz students of Garfield High School. The exercises Naomi used were engaging, thoughtful and cultivated a strong feeling of teamwork and very sensitive listening. A refreshing perspective on musicality.